• A New Year and Nu? Reveals a lifetime of Good Ol' Boy intolerance. After seeing his lead in the Virginia Senate race drop by nearly 10 points in just 12 short days, Virginia Senator George Allen finally apologized last week to S.R. 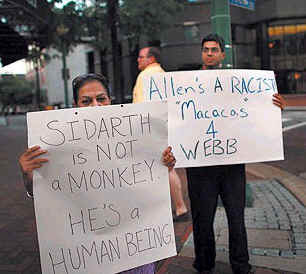 Sidarth for using the racial slur 'macaca' to describe the 21-year old Virginia native of Indian descent who is working on the Jim Webb for Senate campaign this summer. For some, the use of a racial slur by a politician who thinks he is presidential material is absolutely shocking. But for those of us who know the real George Allen, the Senator's use of a racial slur is just another example of his 'Good Ol' Boy' intolerance. Forced to Apologize to Democratic Opponent for Implying that she Supported an Iraq Victory in the Gulf War: After winning his election to the governorship in 1991, Allen apologized to his Democratic opponent for running an ad that "question[ed] the wisdom - if not the patriotism - of [his] Democratic opponent." Shamelessly, Allen's campaign superimposed a picture of his opponent over an antiwar demonstration that highlighted a banner reading "Victory to Iraq." (Washington Post, 11/12/91). Temper or just Plain Mean? In her book Fifth Quarter, Allen's sister Jennifer Allen outlines Senator Allen's mean streak and short temper. A Community Menace: When describing how George and her brother Gregory would destroy neighborhood mailboxes, Jennifer writes, "George would swerve his Mach II Mustang while Gregory held the baseball bat out the window to clear the mailbox of its post." Holding Sister over Railing at Niagara Falls: Jennifer writes, "Ever since my brother George held me over the railing at Niagara Falls, I've had a fear of heights." Like we said, just another example of George Allen's Good Ol' Boy intolerance.